As per the fast growing technology today smartphone are too much advanced than others. Latest technology smartphone comes with advanced features which is useful for us. 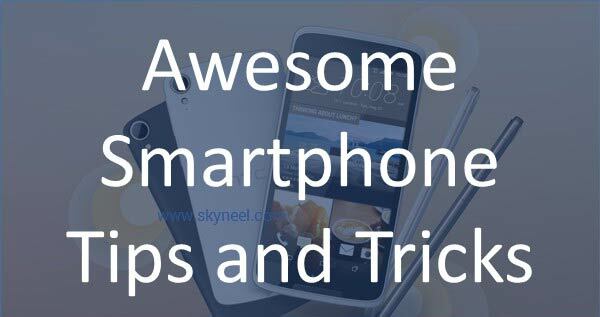 Today we have to discuss top awesome smartphone tips and tricks which you should know. There are lot of universal tips and tricks for any Window, iPhone or Android phone. These smartphone tips and tricks solve your lot of problems. Smartphone are too much essential for us . There are lot of universal tips and tricks are available but in this guide we have to discuss top 11 awesome smartphone tips and tricks. Smartphone overheating is a big problem which is faced by most of the users. Sometime most of the smartphone users complain regarding overheating problem. You don’t have to use smartphone during the charging, change socket, check phone charging cable, check or change phone battery, compress the data. After spending few months lot of person have to face charging problem in his smartphone. It’s a common problem which is found in different smartphone. You can resolve this kind of issue by swapping the charging the cables, clean USB port, change the power socket, close all running unwanted apps, use original charger at the place of local charger. If you want to quick charge your phone then switch off your device during the charging of your smartphone. Most of the smartphone users complain that his smartphone consume lot of battery or take lot of time during the charging. You have to reduce or adjust the brightness, turn off the un-necessary updates, remove home screen widgets, wallpapers, close background running apps. You can also turn off unwanted notification and also turn off vibrate mode from your smartphone. Most of the smartphone users don’t want to upgrade his apps and phone software. Due to which they have to face different kind of problem in his smartphone. If you have latest updates of your smartphone apps then you have to immediately put your phone for software update. Your phone not only faster than previous but also resolve lot of issues from your smartphone. When you turn on mobile data Internet on your smartphone there are lot of media files, video, images and many more consume lot of space on your phone. Due to which your smartphone face hanging problem, overheating problem and lot of other issue. To overcome this kind of problem you have to compress the data. To do this job you have to active compress data option in browser settings of your smartphone. When you turn on mobile data or WiFi on your smartphone there are lot of apps, movies, videos, images, documents and other thing occupied lot of memory on your phone. There are lot of junk files also stored on your phone which not only consume lot of space but also generate lot of problem. In that situation you have to clean the internal memory from your smartphone, transfer important data from internal memory to SD card, delete unwanted data from your smartphone. After that your smartphone not only boost up your smartphone but also resolve lot of issues. Most of the smartphone users love to download and install different apps on his smartphone. These apps not only consume lot of space on your phone but also generate hanging issue, low storage and other issue on your phone. In that situation you must have to remove or close all running background apps from your smartphone. To to this job you have to tap on the Settings > tap on the Apps > tap on any app which you want to stop > tap on the Force Stop option. Facebook, WhatsApp, Twitter, Emails and others apps notification not only consume lot of phone battery but also disturb you lot of time. During doing an important job if you get regular notification from these apps then you will be disturb. You must have to immediately turn off all those notifications from your Android phone. If you want to turn off the notification then tap on the Settings > Apps. Now uncheck the Show notifications option from your smartphone. Most of the person love to install different apps and games on his smartphone. These apps and games not only consume lot of phone battery but also generate lot of issue on your smartphone. If you want to overcome that type of problem then you have to immediately remove unwanted apps and games from your smartphone from Settings > Apps > All > Select the games or apps which you want to remove > tap on the Uninstall option. Backup is an important utility of your smartphone but most of the person does not have to use this feature on his phone. Due to which they have to lost his important data, contact list and other things from your phone. If you don’t have backup then it very difficult to get back your lost phone data. To overcome this type of situation you have to use cloud storage facility on your phone for taking online backup of your phone data. With the help of cloud storage your can easily keep safe and sync your important data. There are lot of best cloud storage like Dropbox, Google Drive, Skydrive, Sugarsync, Box all service as a cloud service on your phone. Cache memory eat lot of system resource which not only occupied space but also decreased the speed of your smartphone. Cache memory is small type of memory which is used to store frequently used data. You must have to regular clean the cache memory from your smartphone. To clean the cache memory from your smartphone tap on the Settings > Storage > tap on the clean cache memory option.